No Jokes Allowed In “Batman v Superman”? If you thought “Man of Steel” was a bit dour and lacking a sense of humor, it turns out there may have been a reason for that. Wrtier Drew McWeeny says: “Last week was about the fifth time I’ve heard that there is a mandate at Warner Bros. regarding any of the DC superhero films in development, and it’s very simple and direct and to the point. ‘No Jokes’.” Others have since weighed in and claim their sources have heard the same. In comics form, DC has generally been seen as the serious, grim brother to Marvel’s more unabashedly fun personality – a trait that has carried over to the movies with films like “The Dark Knight” and “Man of Steel” not exactly known for their humor beyond the odd moment. McWeeny adds that this mandate could be something else though – a reaction to the failure of “Green Lantern,” a DC Comics film that was admittedly trying (and failing) to be funny. As a result you won’t see Warners attempt a “Guardians of the Galaxy” style humorous caper movie based on a DC property any time soon. 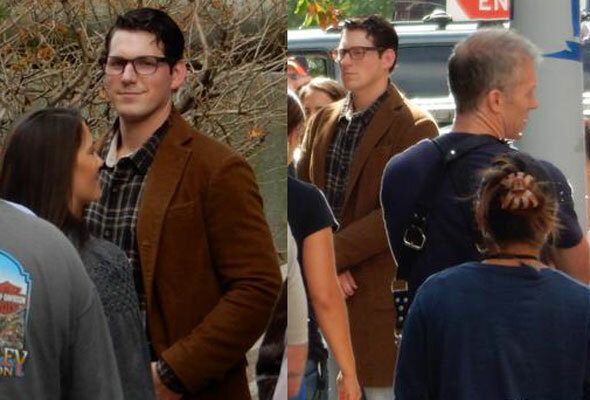 Also popping up today are photos of a stand-in for Henry Cavill dressed in the attire Cavill will sport as Clark Kent in the film. The shots were taken outside the building redressed as the Gotham City Police Department for ‘Dawn of Justice’.